The meeting and draw for the Seamaster 2018/19 European Champions League Women will be held this Saturday, July 7th (10h30 – 16h30 CET) at the Victor's Residenz-Hotel in Saarbrücken. Twelve clubs will be divided in four groups, like in last several seasons, as best two from each group secure their spots for the quarter-finals. No. 2 seed and two-times ECLW runner-up, Poland`s KTS Enea Siarka Tarnobrzeg has kept the same leading quartet - Elizabeta SAMARA (WR 19), HAN Ying (WR 26), LI Qian (WR 31) and Viktoryia PAVLOVICH (WR 55), while other players in the Zbignew NECEK squad are following: GU Ruochen (WR 134), Kinga STEFANSKA (WR 271) and Agata ZAKRZEWSKA (WR 455). ECLW record holder with four crowns TC Berlin Eastside occupies third place on the Seeding list, with three new names: GU Yuting (WR 17), Matilda EKHOLM (WR 30) and Nina MITTELHAM (WR 58). Two Berlin`s legends, Georgina POTA (WR 37) and SHAN Xiaona (WR 54) will try to secure their places in the line-up, guided again by Coach Irina PALINA. Two-times winner Linz AG Froschberg has decided to build its new team around Sofia POLCANOVA (WR 18) who will be supported by Hong Kong`s SOO Wai Yam Minnie (WR 33), Japan`s Yui HAMAMOTO (WR 34), Linda BERGSTRÖM (WR 113), Mariia TAILAKOVA (WR 126), Karoline MISCHEK (WR 159), Denise Payet (WR 318) and Rebekka CARLSEN (WR 339). Former Froschberg`s ZHANG Mo (WR 23) has signed for TT Saint-Quentinois, being best ranked player of No. 5 ECLW seed. French side also counts on Polina MIKHAYLOVA (WR 49), Audrey ZARIF (WR 112) and Olga MIKHAYLOVA ( - ), Aurore LE MANSEC ( - ) and Lou FRETE ( - ). There are two newcomers among the 12 ECLW participants, Etival Clairefontaine ASRTT from France (No. 6 seed) and Portugal`s Sporting Clube de Portugal SCP (No. 12). 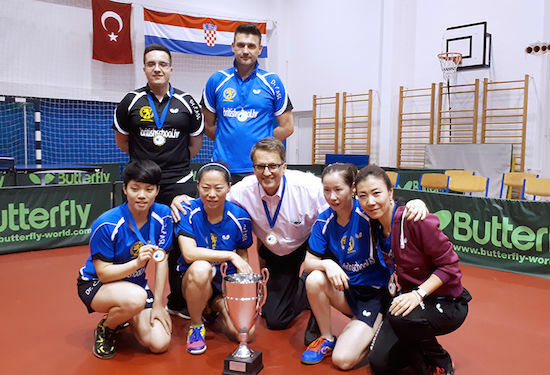 French side is better ranked than Portugal`s one, but Sporting has two well experienced players in the ECLW, Daniela DODEAN MONTEIRO (WR 95, her husband plays in the Sporting men`s team) and 2013 European Champion in the Women`s Singles Event, LI Fen (WR 153) from Sweden.